Home → News → Thank You for Your Feedback! 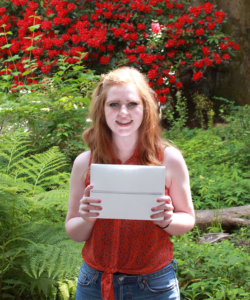 Congratulations to Casey Mitchell, a Portland State student who took the library survey in April and won the grand prize drawing for an iPad. Casey is a junior at Portland State and is majoring in both history and pre-education. After she graduates from PSU, her goal is to be a middle school social studies teacher. Thank you to all 1172 members of the Portland State community who took the time to complete the survey in April. You provided feedback about library services and made your voice heard. Most importantly, your feedback will continue to help shape the future of the PSU Library’s planning!